Cholesterol lowering drugs called Statins generated $34 billion in sales in 2007 and have raked in over a quarter of a trillion dollars since they were introduced two decades ago. A new study reported in the NY Times links the use of statins with a higher risk of developing diabetes. This is just the latest in a seemingly endless list of side-effects that continue to be discovered from the long term use of these drugs. Part of the problem is that people fail to realize that statins (like almost all prescription drugs) are not meant to be taken long term – they are a short term temporary "band-aid" while you make lifestyle changes (diet, exercise, nutritional supplements) to return your cholesterol levels to an optimal range. There is also the possibility that your cholesterol levels can drop too low, which is dangerous because your body needs cholesterol – it is important in the production of cell membranes, hormones, vitamin D and bile acids that help you to digest fat. Cholesterol also helps your brain form memories and is vital to your neurological function. For certain individuals who are at very high risk of dying from a heart attack, statin drugs are warranted and can be useful. However, this is only true if there is a strong heart attack risk – not simply "high" cholesterol levels. Unfortunately, these are the most widely prescribed drugs in the US, and now pharmaceutical companies are pushing to have them prescribed to healthy individuals on the basis of heart disease "prevention". You read that right, instead of prevention through healthier eating or becoming more active, we'll just drug you and not worry about the laundry list of side-effects. Drugs and surgery should be a last ditch effort to save a body that can't survive on its own, not a way to regain or maintain health when your body first signals that there is a problem. 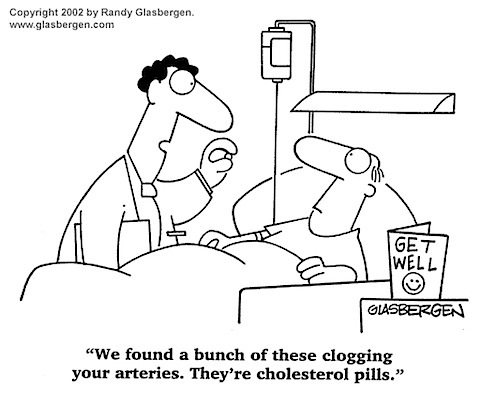 If you or someone you know is dealing with high cholesterol, try first to lower it naturally- without drugs. After all, Heart disease is not the result of a Lipitor or Crestor deficiency. It is the end result of our unhealthy diets, low fitness and high stress levels, and exposure to environmental toxins. Taking a pill won't fix these problems. Dr. Peter J. Braglia, D.C. has a mission to educate, adjust, and inspire a health transformation in as many families as possible toward optimal health. To learn more about his practice please visit his website and his Facebook page. Listed below are links to blogs that reference this entry: Are Statins Worth the Risk?. This page contains a single entry by Toni published on September 17, 2012 3:42 PM. Marijuana Compound Found Superior To Drugs For Alzheimer's was the previous entry in this blog. Australian children as young as two being prescribed Antidepressants is the next entry in this blog.